Native silver is among a handful of minerals that have been deemed inherently valuable by mankind since antiquity. It was (and still is) considered both valuable and useful, playing an integral component in the development of economy and industry for every major producing locality. In fact, the practice of mineral collecting was first recorded in the late 1400s, and the earliest known mineral specimens ever collected are two examples of silver from Saxony, Germany. Today, silver specimens (and silver sulfosalts) are considered “classics” in the mineral collecting community and have a devout, cult-like following, making them timeless collectibles. Silver is especially collectible in the wire and crystal forms. While crystalized silver is rare and highly prized, very few examples exhibit the sharp, fine-caliber crystallization found in many other minerals. In fact, most crystallized silver specimens tend to have crude crystal habits with little definition. Generally speaking, wire silver specimens are the more desirable alternative for their dramatic and artful formations. 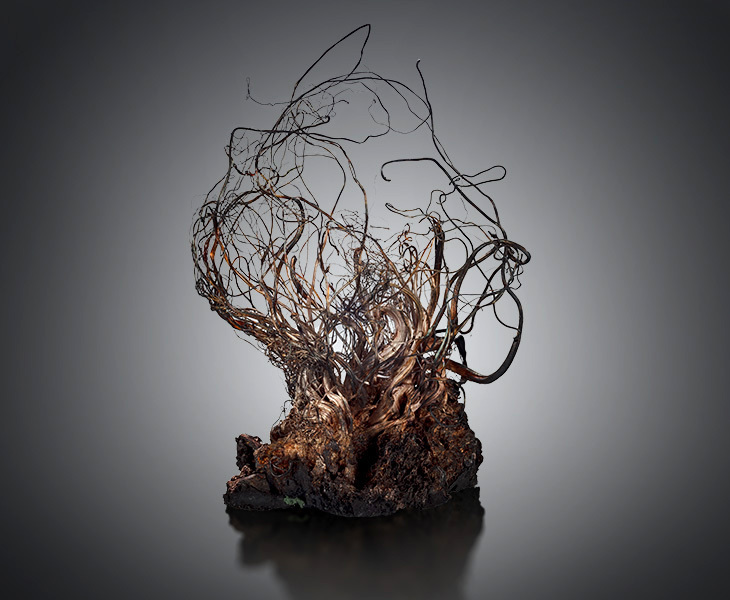 Many of the most coveted of these wire silver specimens are from the Freiberg district of Germany, and the mines of Kongsberg, Norway. Both localities are known to produce stunning wire examples with a bewitching allure all their own. Mineralization of the Freiberg Mine occurred in two cycles, the first was the Variscan Cycle (approx. 320-280 million years ago), the second is the Post-Variscan Cycle (approx. 210-140 and 80-30 million years ago). Silver mining in Freiberg began in the 12th century and was active up until approximately 100 years ago when production slowed and mines began to close. The very last of the mines closed in 1969. Today, Freiberg specimens are considered relics of a mining tradition and wonderful tokens of German history. The best wire specimens produced from Freiberg (and Kongsberg) have long, winding tendrils that are robust at their bases and taper towards their ends. These strands twist and turn, resembling gnarled winter trees devoid of leaves. They also tend to have a black/copper/ nearly rose-gold patina that is indicative of a piece that was left uncleaned and preserved in its natural state. That patina tends to add a powerful, almost theatrical aesthetic to silver specimens and is highly desirable amongst collectors. In a word, they are dramatic. This is a very fine example of Freiberg silver that exhibits wonderful balance, and a highly desirable, twisted, gnarled aesthetic. It has delicate, wispy wires that bend and twist artfully and intertwine amongst themselves with grace. The piece has a bright, silvery patina in some areas as well as a dark oxidation in others which adds texture and depth. It was a part of the Alexander Delerm collection for many years. Delerm (a good friend of Daniel Trinchillo) was an avid collector who selected minerals with a fine eye for beauty. At the time of his passing (2015), Delerm’s son, Michele contacted Trinchillo to evaluate and acquire pieces from the collection. This piece was among the group that was hand selected by Trinchillo for the gallery, Mardani Fine Minerals where it is now on display.